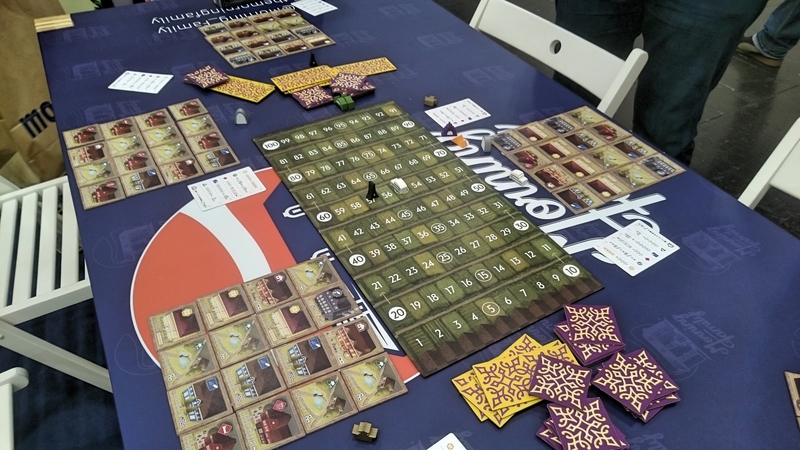 Our third Essen report comes from the well-rested Lizzy, who, on the way out to get some dinner on Night 2, accidentally fell asleep instead and so is actually pretty well-rested. Incredibly rare for a board game convention, where sleep is normally a very limited resource, only available when you’ve run out of beer and are waiting for Messe to open its doors to you again. 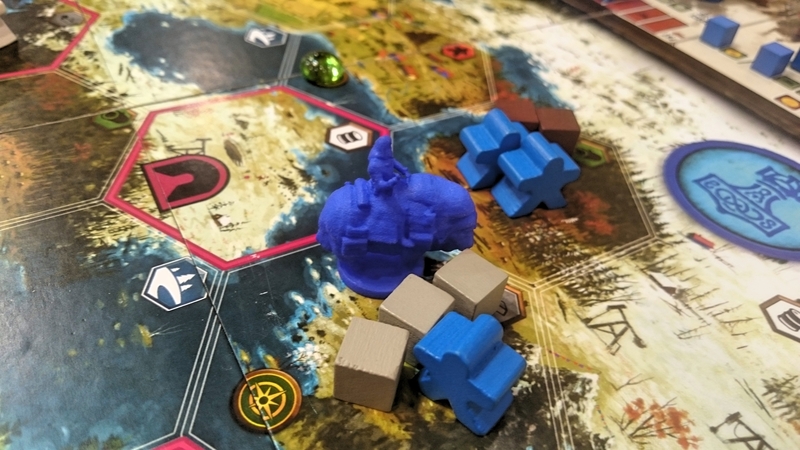 As before, Bob is playing social media guru and is live-tweeting our trip to Essen, check it out. She bought a data plan for her mobile and is going mad with it. Mad! Also if you’re hungry for even more Essen, Lizzy and Briony wrote up the first reports for days one and two. Right. It’s Saturday morning, you’re full of Walnussplunder and Butterkuchen… go! If there’s one game that Lizzy ‘didn’t even bring a spreadsheet’* Miseryfarmer was hyped about, it’s this. 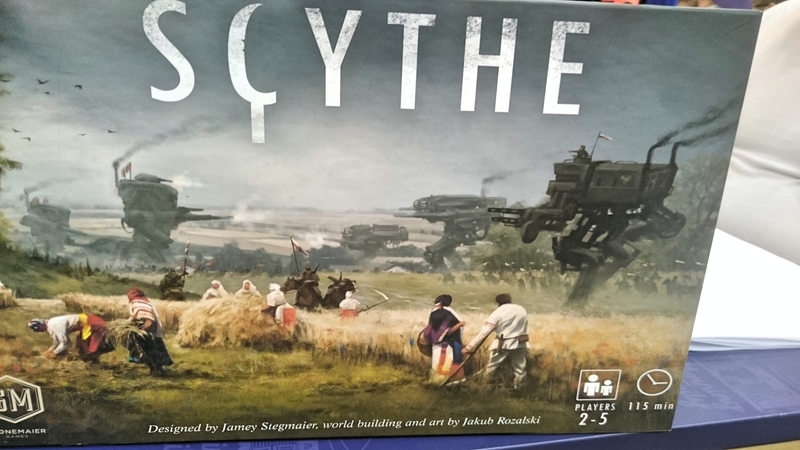 Scythe isn’t available yet, it isn’t even up on Kickstarter until next week! But it comes from a pretty solid background of previously beautiful kickstarted games, of which Euphoria is probably the most memorable. The game is pretty popular already. Bookings to try the game are at a premium, and a lot of people are being turned away, even with testing limited to an hour at a time. Because it’s in such early stages, the pieces aren’t quite done yet. Lizzy’s hawk lady came without a hawk, the shiny pile of coins were apparently not in their final form and some of the pieces were definitely the wrong shape. The hawk lady’s yellow ‘stars’ happened to, for example, look exactly like yellow lightning bolts from Euphoria. Funny, that. The game comes with the most beautiful art of mechs and a fallen Eastern Europe, and you can tell. Everything about it so far is beautiful, and you know the rest will be too. We got a fair idea of gameplay during the hour’s test and, luckily, it seems to be exactly what you want for a game that looks like it does. It comes with building, expanding, fighting, resources, colonising, rising to power. We cannot wait to play it some more. The hall was already damn busy by the time we were looking for a second game, but before long Bob enthusiastically dragged us over for a quick game or two of Codenames. 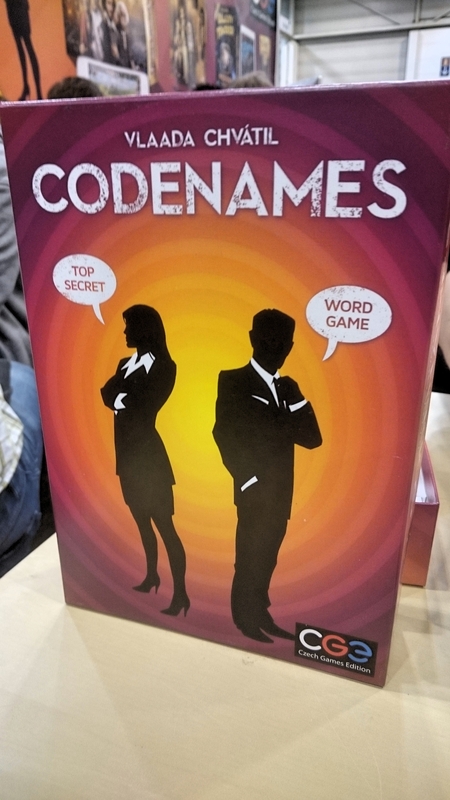 Codenames is another one of those games that you end up only trying because of luck or the insistent recommendations from people you trust. Bob is often trustworthy and persistently insistent, so we cast our doubts aside and sat down. You only need to take one look at it to figure out why we might’ve been a bit sceptical. The box is awful, and one of the dark figures on the front even has a speech bubble coming out of it which says ‘word game’. Word game? Really? Is that how low I’ve stooped during rush hour at Essen? We’re reassured that Shut Up and Sit Down themselves describe it as an excellent game with a terrible box. And it turned out to be just that! It’s a word association game, but in the best way possible. There are spies, competition and mocking. There’s a slightly dodgy two-player mode for it as well, but we strongly recommend you try it with four or more, for better making fun of the other team when they think that the clue “wedgie” matches “plane” rather than, say, “pants”. You know who you are! To our surprise, we soon ended up bagging a seat at our second Stonemaier game of the day for Between Two Cities. The game’s novelty is that you’re building two cities, one on either side of you, but each city is being shared by a person on either side. Your lowest-scoring city is the one which gets you all the points at the end, so victory ends up being a bit of a balancing act. It’s good, and it has a satisfying level of simplicity and quickness as well as a having potential for good level of strategy and tactics. 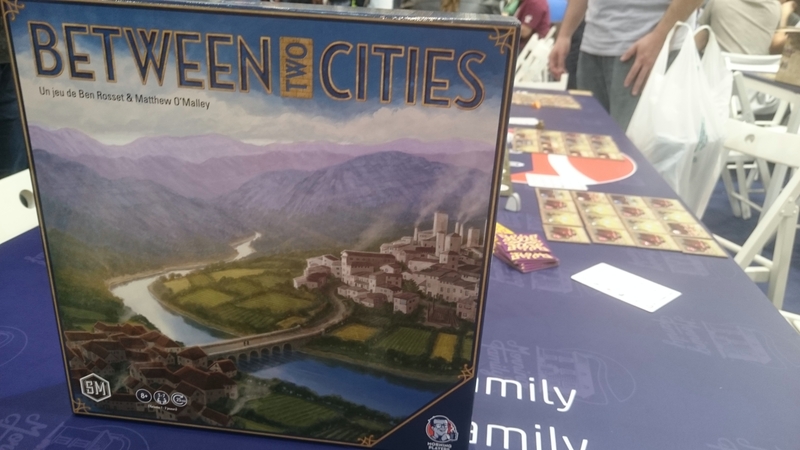 To play it feels a bit Suburbia crossed with Mad King Ludwig crossed with Seven Wonders. Which is fine by us! 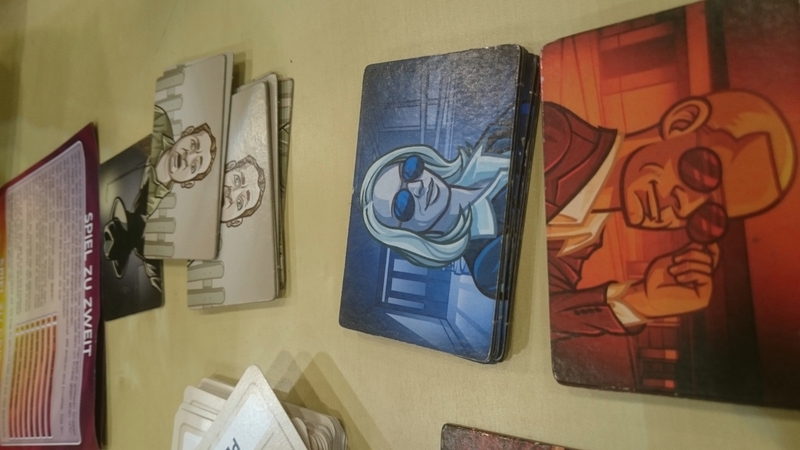 A perfectly reasonable game, and one of our number left with a copy in their bag. 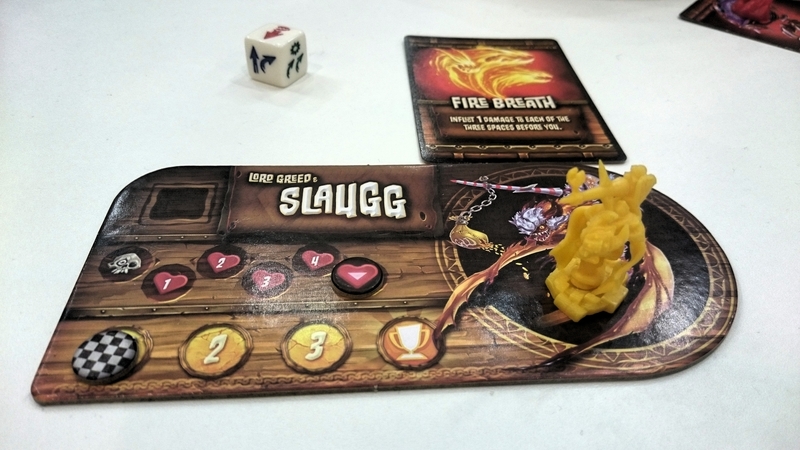 Another smaller game, in which you each play a hero riding a monster. Three laps of the racetrack wins! You may die a few times, and also blast some enemies into some lava. Simple stuff, some dice rolling and some mild fun. Also contains a character called “Cthooloo” which is definitely the first time any of us had seen it spelled that way. A little bit telling was that when we were choosing characters, the rules explainer advised us that Cthooloo wins most of the time. Oh! How much is most of the time? Erp, 90%? Cthooloo won our game as well. Is this a flaw, or is it secretly actually an amazingly accurate representation of the mighty dark lord Cthulhu? This final game was another case of a last-minute choice based on glimpsing a free table in the distance. 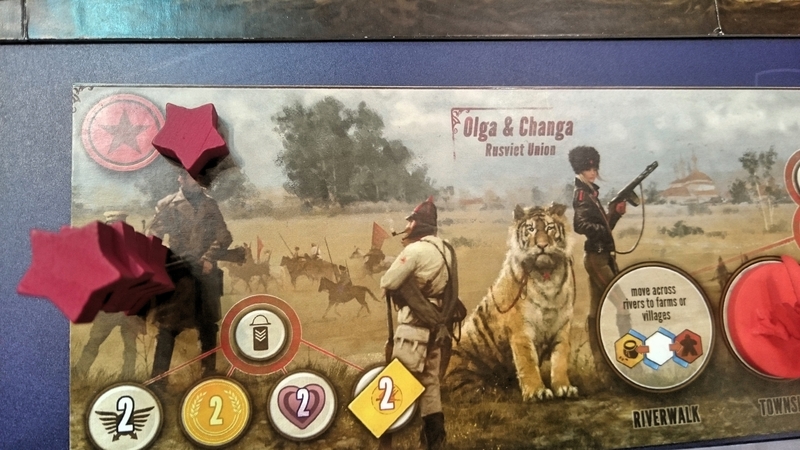 Conquest Stratego is based off another game, Stratego, which thanks to our excellent research and journalism skills we can tell you almost nothing about. We can, however, tell you about Conquest Stratego. 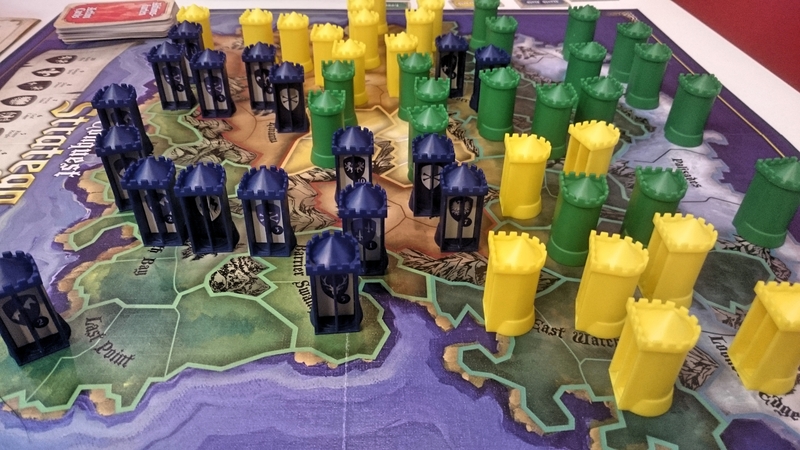 CS is a game of battles, a bit reminiscent of Risk, but without dice rolling. Instead of dice rolling your pieces have a range of numbers from 1-10 and, bar a few exceptions, the highest number wins. The game has one neat little mechanic which we’ve not yet seen before, which is to have these strange little capsules for each of your pieces, designed so that only you, at one end of the table, can see what your number is. This actually worked better than we’d hoped, which is probably also how we’d describe the game as a whole. Not that bad, but wouldn’t personally buy it. As always, the real winner is board games. As day four dawns, your brave journalists are heading out for one last morning pastry for the final day! Wish us luck. *Bob brought so many spreadsheets for Essen board games. Cumulative cost was the scariest column.